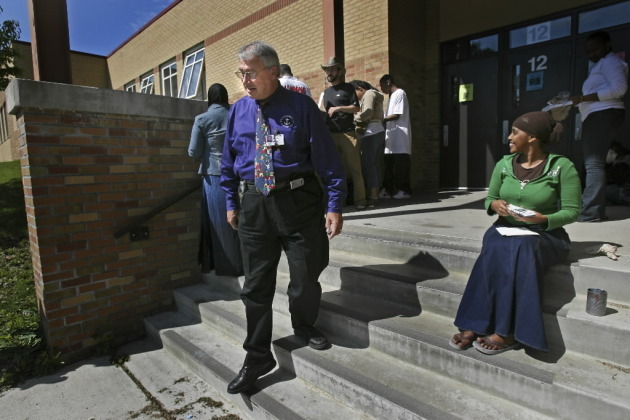 Principal Bill Smith of Southwest in a 2006 file photo. Southwest High School in Minneapolis ranks highest among the state's high schools in the frequently cited but oft-criticized rankings released Tuesday by U.S. News & World Report. The high school was one of three Minneapolis schools ranked in the top 30 state high schools by the magazine's rating process, which relies heavily on student proficiency for graduation tests, and the share and performance of students taking advanced courses. South High School ranked 24th and Henry High School ranked 28th. St. Paul Central ranked sixth to round out the top-ranked core-city public high schools. All but one of the remaining schools in the top 10 area suburban public schools. The U.S. News rating put Southwest at 163rd among the nation's best highest schools, a considerable jump from 214 in 2008. South also jumped from 1165 to 948, but Henry dropped from 877 to 997. No Minneapolis-based charter high school scored high enough to be ranked. The ranking have been criticized in the past for relying too much on factors that are influenced by how many students within a school are minorities or those getting subsdized lunch, groups that tend to score lower on tests. The magazine said that this time it adjusted performance on graduation tests for the percentage of a school's students in poverty or who are students of color, in an effort to make sure a school serves all students. But it then factors in the percentage of the student body taking and passing advanced-placement or International Baccalaureate courses and tests, evidently without an adjustement for poverty or race. Southwest has the whitest student body among the seven traditional high schools, at 57.5 percent, and the lowest poverty share at 36 percent.